Updated Monday May 21, 2018 by AUBL Miami. 2 games Saturday 5/26/18, 1 game Sunday morning 5/27/18. There are 6-8 teams expected to participate. The top 4 teams with the most points after the three game qualifier round will advance to the semi-finals on Sunday afternoon 5/27/18. The winners of the 2 semi-final games will advance to the finals on Monday 5/28/18. Tie games are permitted. Tie breaker rules will be used to select playoff teams. Tie Breaker 1: In the event of a tie in the standings (2 or more teams tied in points and winning percentage), the first tie breaker is head to head competition. Tie Breaker 2: If there is no head-to-head result, the team with the fewest runs allowed wins the 2nd tie breaker. Tie breaker 3: In case of another tie, the team with the most runs scored wins the 3rd tie breaker. Tie Breaker 4: The final tie breaker is a coin flip. 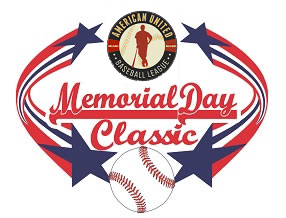 The Memorial Day Classic is played under AUBL Miami rules. 1. In each team’s batting line-up, a minimum 9 batters must be used. You may add batters to the bottom of the lineup at any time during the game but you may not subtract batters from the line-up once they are added. 2. Free defensive substitution. There are no restrictions on defensive changes except the pitcher re-entry rule. 3. Pitcher re-entry rule: In the case of a pitching change, once a pitcher has been removed, he can only pitch again after one complete inning has been played (3 consecutive outs). 4. No intentional physical contact between base runners and defensive players. Violation of this rule will result in an automatic player ejection. 5. Qualification round games are subject to typical AUBL Miami time limit (no inning can start after 3 hours). Qualifier games may end in a tie. Playoff games must play to a result with no time limit. Any playoff game that goes to the 11th inning will be played under World Baseball Classic rules (start with runners on 1st base and 2nd base - runners are the last 2 batted outs). 6. In the event of rain, official game recorded only after 5 full innings completed. Games started but not completing 5 innings will be suspended and completed later. Offensive line-ups remain in tact and the game must resume at the point the game was suspended (from the scorebook). 7. All Team Managers are asked to please text all game results to (305) 439-2644 immediately following the game, so that the standings can be updated in real time.